''Day 24 on the big spending ban and Lauren has gone mad''.....Hey everyone today I have another spending ban update. It has been 24 days since Jess and I started this spending ban and boy it has been hard. I have had times these last 2 weeks where I have had the urge to go shopping. I really want to go into Pennys/Primark and buy literally everything. I have a few makeup items on my wishlist but the urge to buy clothes and handbags and homeware is way stronger. How sad do I sound. 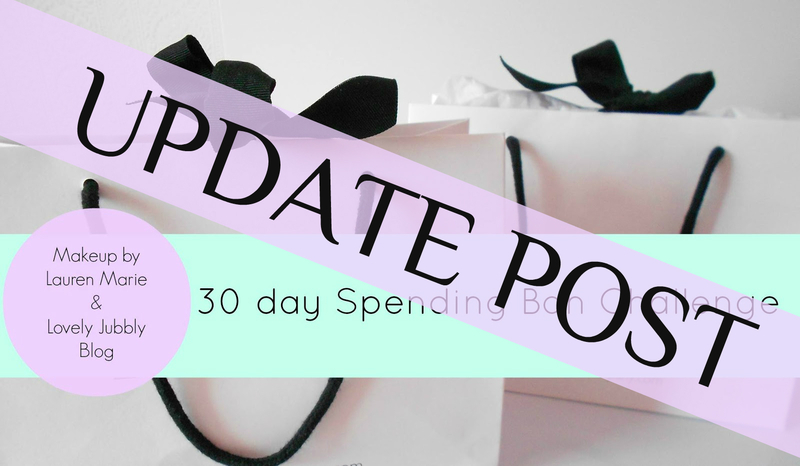 In terms of spending this month, I haven't bought anything since my last update. Not even a easter egg. I did send a few parcels off so thats the only thing I have handed money over for.I also took it upon myself to remove my credit card off paypal as I did find myself browsing ebay way to much over the last 10 days. So I removed the card. Its the only way. Half the time I would be lounging in bed on ebay and the effort of getting my credit card out of my bag and then to type in numbers....major effort so removing the card was my best bet. I don't really have anything else to say in terms of an update. I have had moments where I just want to say f**k it but then I just go and talk to Jess on facebook and I forget about even wanting to buy anything. I am really not sure how I will last sticking this ban out till August. I think I will need therapy after it all. So I have decieded to wait till May 1st, go one a little splurge and then restart a ban till August. I will get to Barcelona this year and hopefully to Wales, so a longer ban is needed. Make sure to head over to Jess's blog to see how she is getting on.